In order to drive forward efficiency and value for money, each year we set targets based on the previous year’s performance and in comparison to other “peer” organisations, similar in size and nature to WHA. We recognise that we can’t do this overnight but year on year we are looking to improve. Performance is reported to Board quarterly and we have also established eight high level key targets for staff which are reported monthly and detailed below. Each quarter we report to our Board on the nine main areas of compliance with legislation in relation to gas, fire detection, electrical safety, legionella, asbestos, lifts, ground contamination and flooding. 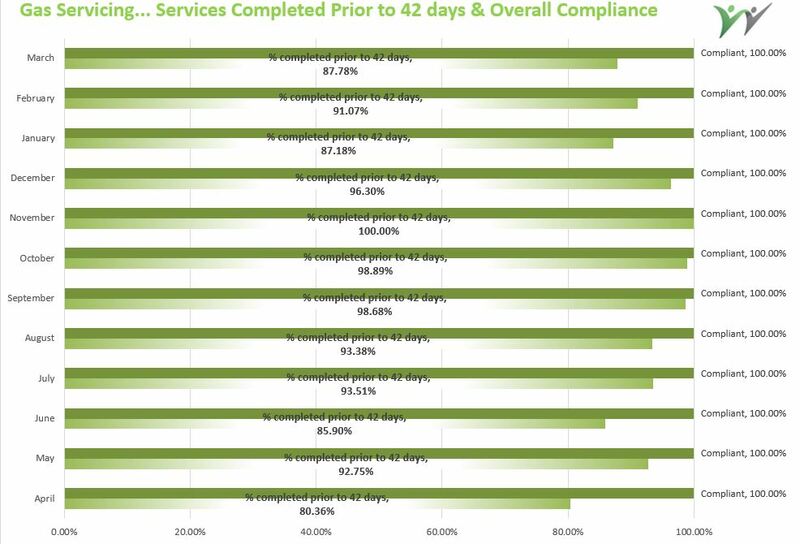 As one of these elements of compliance, gas safety is a good indicator of how we are performing generally, and last year we maintained 100% compliance, and we need to continue to do this to remain within the law and to keep our customers safe. By the end of March 2019 we will have maintained our 100% performance record and we will also track our performance where we have managed to obtain gas certs at least 42 days before their expiry. Next to staffing costs, maintaining our homes is the largest area of expenditure for WHA. In fact, with an average per property maintenance cost of £310.44 per annum we spend more than most of our peers on the maintenance of our properties. While we will continue to invest in our customers’ homes (for example this years planned maintenance budget is nearly £1 million), we need to reduce the overall costs of maintenance. By the end of March 2019, we want to reduce the average spend per unit by at least 1%, net of inflation. We are fortunate to have a very high quality and well maintained housing stock, but each year, about 80 of our properties will become empty and have to be re-let. For every day they remain empty the Association loses income. Last year, for example rent lost through empty properties cost the Association nearly £14,000 with each property being empty for an average of 14.37 days. By the end of March 2019, we want to reduce the average number of days our properties are empty to 13 days. 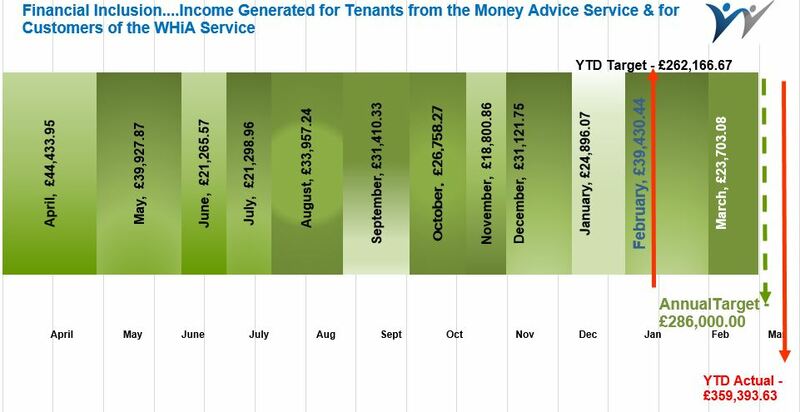 At the end of last year, our customers owed us £171,245 (3.27%) in rent arrears. It’s the rent we receive that pays for the vast majority of the services we deliver, from subsidising our social value activities, helping pay for new homes, repairs and maintenance and even the wages we pay our staff. Rental income is our life Blood and with the challenge of Universal Credit and Welfare reform generally it’s important that we retain our focus on income. We use various methods to assess what our customers think of the service we provide. For example; every couple of years or so, we complete an Association wide satisfaction survey, at key interactions, such as when a customer gets a repair completed or as people move into their new home, or on completion of an adaptation, we try to assess how satisfied customers are with that specific piece of work or service. This year we want to focus on “Net Promotor score” – this is essentially the recommend a friend question that you might get asked when you buy a product or receive a service. Using this score allows us to directly compare different aspects of our service, and also allows us to compare ourselves with other organisations inside and outside the sector. By the end of March 2019, we will continue to be a top quartile organisation maintaining the net promotor score of 71 which we achieved through our STAR survey in 2016. Volunteer support – We like to encourage volunteering, be that through our customers who give up their time on our scrutiny panel, through to the volunteer programme we have in lifetime which encourages people to active and involved. – Last year the cash value of the volunteers that supported us across WHA amounted to £73,964.64. This year we want to increase that even further in aiming for £81,400. Increasing income for our customers – A key part of our social value work is ensuring that our customers maximise their income. For example, last year, with our help, our customers directly benefited from £256,928.03 in additional income through welfare and other grants. This year we want to increase this figure further with a target of £286,000. Sickness can be a significant cost to any organisation, it is also often a good barometer of staff engagement. Last year we lost, nearly £52,000 due to staff sickness and although we tried to respond to this through support from other staff and additional temporary posts, there will have inevitably been an impact on quality of service to our customers, and we need to try and reduce this where we can.